it's not a new clinic. They just transferred to a bigger building. It was located at the other side of the road before, that would be beside 'Tindahang Magdamag'. Naval is the surname of the Dentist, Dra. Kat Naval. She has a twin who is a dentist as well. I've been going to their clinic since 5 years ago. They have very good service. I recommend it there. Although, since they have transferred to a more pleasing location (well, building-wise), not sure if they have also increased their rates. That I still need to find out in my next visit. Thanks @toringjo for pointing that out. ;) Funny that when I first saw the clinic, I thought it was for Navy officers from the military. And I was thinking why in Marikina ? yun pala, Naval as in the name. :D Thanks for the tip ! can I have the clinic number please? Actually, it's not 'Naval' referring to the navies but rather named after the founder, Priscila D. Naval. It has a good and lovely building nice too see it.Thank you for sharing,,it is really very useful,,some dentist have better experience that other ones. Excellent dental office and wonderful dentist! Very concerned with the patient's comfort and explains everything. So glad he is in Riverbank! Missing teeth in your mouth can make your smile look horrible and your health can also suffer on account of these missing teeth...so its good and nice blog. Thank you for providing your insight into the topic. May God bless you always! 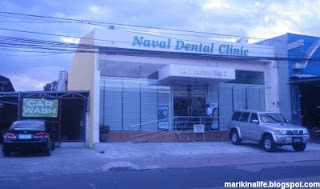 Thanks for the info, I will tell my friends there in Marikina about this dental clinic. If you are looking for dental clinic in makati, you may want to check out Estetico Manila. Excellent dental office and wonderful dentist! Very concerned with the patient's comfort and explains everything. So glad post. Do you have any suggestions about the best dentists in Quezon City?